‘Big Brother 20’ Spoilers: Swaggy C Proposes To Bayleigh on Instagram – BB20 Engagement? Big Brother 20 spoilers hint that recent evictee Swaggy C (Chris Williams) proposed to Bayleigh Dayton on Instagram. It’s too bad Bayleigh doesn’t know that Swaggy put a digital ring on it. Here’s what’s happened with this showmance and what’s next. Bayleigh and Swaggy hit it off immediately on the CBS popular reality show. They connected on the sixth day in the house. However, with Swaggy the second houseguest evicted, did their showmance end? No – far from it! Check out our Big Brother Facebook group! During Swaggy’s exit interview with host Julie Chen, he indicated that they were developing a relationship. He calculated they had spent 600 hours together. From all indications, Swayleigh was in an intimate relationship in the house – both emotional and physical. 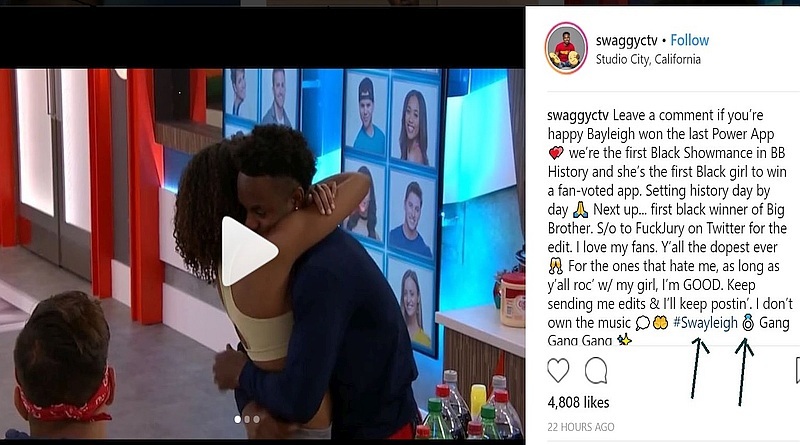 From what viewers saw and what Swaggy has posted on his Instagram post-eviction, it’s evident that their showmance is real. On the night before Swaggy was evicted, he and Bayleigh talked about a future together. Had he stayed, Swayleigh could have been a love story like “Jody” in Season 19 (Jessica Graf and Cody Nickson). Jess and Cody are engaged and planning a fall wedding for 2018. Now it seems Bayleigh might be the next Big Brother love match to get hitched. Bayliegh is still in the house and is not up for eviction. In fact, she was the last one to win a power app from the BB App Store. She won’t know for a while that Swaggy seemingly proposed and put a virtual ring on her hand. Because the shared intimate moments together, perhaps their relationship was strong enough for both of them to know how it was going whether they were in or out of the house. You can see Swaggy’s recent Instagram post below where he talks about his new love. Check out where the arrows point and see their couple name (Swayleigh) and the ring. That sure looks like a sign of something serious ahead. 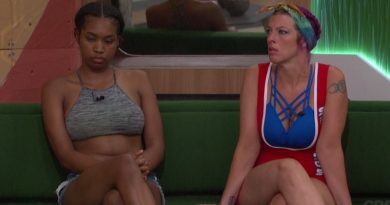 Swayleigh’s journey in the house is a lot like Jess and Cody’s in BB19. Another Big Brother love story! The BB19 house evicted Cody early, like Swaggy. But Cody fought and won his way back in, only to be eliminated a second time. However, at his eviction interview, Cody said he wanted to marry Jessica. Now Jessica is wearing an engagement ring. Similarly, Swaggy admitted to Big Brother host Julie Chen at his eviction that he loves Bayleigh and she feels the same. As seen in the Instagram post above, Swaggy complimented Bayleigh for being the first black female to win a power app. He mentioned that fans might not have liked him that much. However, he appealed to them to continuing liking and respecting “his girl”. In Swaggy C’s customary style, he also mentioned that they are the first black showmance in Big Brother history. It is almost a sure thing that viewers have not seen or heard the last of Swayleigh. What do you think? Was that digital ring a sign of a real-life engagement ahead? Swaggy just told Us Weekly that he and Bayleigh made plans to move in together but now it seems they might also be man and wife! Be sure to follow Soap Dirt on Twitter and like us on Facebook for the latest info on all your favorite soaps and reality shows. Come back to Soap Dirt often for Big Brother news and spoilers. ← ‘RHONY’ News: Luann de Lesseps Back In Rehab – Duped Fans With ‘Sober’ Claim? I love watching reality television and writing recaps of the shows. It is as if I am encountering the experience all over again. I have been an online writer for nearly 10 years. It is a pleasure to join the team at Soap Dirt. ‘Big Brother’ 20 Spoilers: Who Are Final 3 Houseguests on BB20? 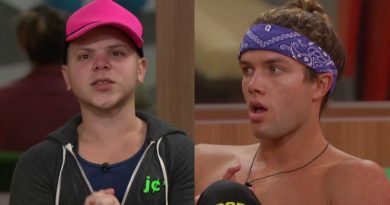 ‘Big Brother’ Spoilers: Twitter Explodes on JC Sexually Harassing Tyler – Eviction Speech Last Straw?